I was barely born when it seems that I developed intestinal poisoning. Dr. Wilson, our family doctor, gave up and announced to the family that my days were numbered. One of my aunts, a graduate of Johns Hopkins, operated by a different calendar whose days were not so limited. She made a very strong tea from an "Orange Pekoe" blend, and I was forced to sip it from a spoon during the next month. I must have survived ..... but to this day I HATE TEA PARTIES. Episode number two occurred when my maternal grandmother was living with us. I caught a severe cold, and such sickness was apparently against her religion. Down she marched to the kitchen, where she prepared an infusion of ginger tea. If the very mention of "tea" didn't cure me, the taste of this concoction guaranteed a speedy recovery. He was abandoned as a child by both his mother and a philandering father. Two very strict aunts raised him, and he became a "loner" spending his time in a nearby woods, studying the habits of animals, living in a fantasy world and dreaming about Indians. Buffalo Bill's touring Wild West Show visited his town at the beginning of the 20th century, and this dreamer made up his mind to travel to Canada, where he learned to speak the Ojibway language. An Iroquois woman, one of his many wives, persuaded him to give up trapping and become a writer. His fame led to many speaking engagements and social functions, often with royalty and heads of state. My aunt (the one who kept me alive with the tea-cure) insisted on taking me to Massey Hall in Toronto to meet this magnificent impersonator when I was seven years old. After waiting in line for what seemed an eternity, we saw a film about his life in the wilderness and two of his pet beavers, "Jelly Roll" and "Rawhide". When the movie ended, a tall, handsome man with a face chiselled by the weather was spotlighted on stage in his rough Indian attire. 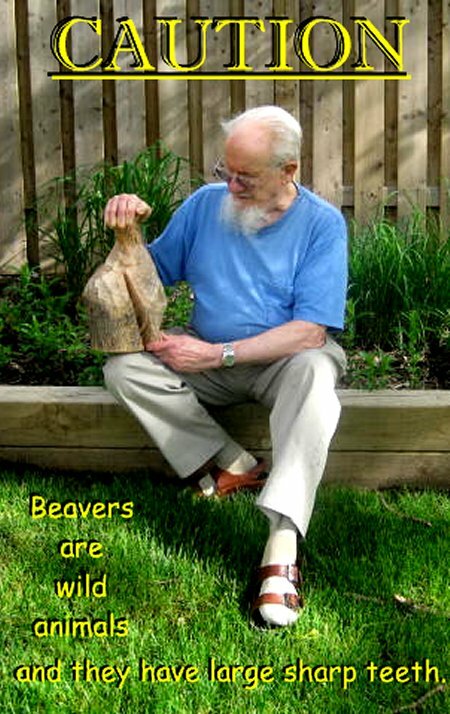 He had a shy manner and I recall the soft persuasiveness of his voice as I received my first lessons about the inter-relationships between man and nature [and the importance of environmental conservation]. I asked my aunt if it was possible to go backstage to meet him. She smiled and led me to the left-hand side of the stage, where a door opened to a stairway leading down to a basement level. At the bottom, I turned right ..... and there he was, twice as tall as I was (or more), and standing with men (in suits) on either side. He noticed me and stepped forward. Hastily, I thrust my hand out to meet his. As I shook the hand of Grey Owl, I blurted out a thank-you for his "entertaining sermon". He (and his entourage) had a good laugh. I left without asking for his autograph. His books and his tours earned him a place of high honour (to my way of thinking) in spite of the fact that when he died in 1938 Grey Owl was revealed to be Archie Belaney from Hastings, England, and (sob) a fraud. ADDENDUM:Donald Benjamin Brown (D6B1) had an Uncle Allen J. Cody (spouse of D6C - and a medical doctor in Sunderland and later Newmarket, Ontario) who was a cousin of William Frederick "Buffalo Bill" Cody. Buffalo Bill Cody mounted his first Wild West Show in 1883, and visited Allen's father whenever he came to Canada. Many tales were told of Annie Oakley, Chief Sitting Bull and Riel's general Gabriel Dumont, who were all members of the show eventually. The buffalo culture of the plains was dead. Uncle Allen and his brother Leroy Cody attended Buffalo Bill Cody's funeral at the Elk's Lodge Hall in Denver, Colorado, after his death on January 10, 1917, at his sister's house. Buffalo Bill was burried on Lookout Mountain in Colorado as was his wish. ADDENDUM: I attended an event at the Toronto Arts and Letters Club on April 10, 2013 , and discovered that Wa-Sha-Quon-Asin had also been there in 1936 (the year before I had met him). Grey Owl's epitaph reads: "Say a silent thank you for the preservation of wilderness areas, for the lives of the creatures who live there and for the people with the foresight to realize this heritage, no matter how." Here are five videos about Grey Owl, which are on YouTube . . .
_ _ _ 1. CLICK HERE for a 1936 documentary entitled, "Grey Owl's Strange Guests". _ _ _ 2. CLICK HERE to see a Grey Owl short by Richard Attenborough and Deejay Ra. _ _ _ 3. CLICK HERE for a brief story of Grey Owl". _ _ _ 4. 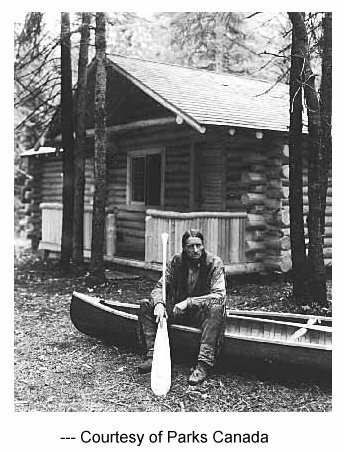 CLICK HERE to view Grey Owl's Cabin - Parks Canada". _ _ _ 5. CLICK HERE for a re-enactment of Grey Owl's decision to write books.